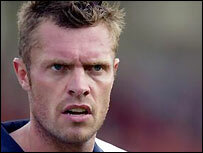 West Brom striker Geoff Horsfield has joined Sheffield United on loan until the end of the season. The deal is with a view to Horsfield signing permanently and the 32-year-old told the Blades' website: "I'm pleased to be coming back to Yorkshire. "Sheffield United are flying at the moment and this is a great chance to get back in the Premiership. "I'm delighted it is done and that I can come back up to Yorkshire and complete the deal." The Barnsley-born striker has previously played for Halifax, Fulham, Birmingham and Wigan. He made his final appearance for West Brom on Saturday as the Baggies were thrashed 6-1 at Fulham.